Remember my blog post about automatically choosing appropriate DataTemplates for an ItemsControl (such as a ListView) by using a DataTemplateSelector? This certainly is useful for items that shall be visualized using different controls, but definitely overkill for scenarios that just need different styling of different items. If you ever find yourself in such a scenario, it’s good to know that the same approach also works with styles instead of data templates. From a developer’s point of view, we’d probably use some kind of list view to implement a chronological list of messages like this. 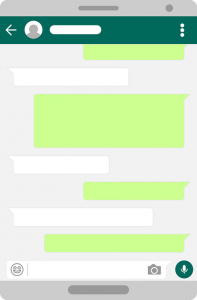 However, there are two types of messages: Sent messages are displayed differently than received ones. At this point, you might think ‘good to know that there is a DataTemplateSelector that allows me to specify two types of control templates for a single list view!’ – but let’s think this through first, is this really the optimum solution? Both types of messages can contain text – what would the two data templates look like? They would probably both contain a label control with some styling applied for background color, left / right alignment, etc. (You might argue that in modern messaging apps, messages do not only consist of text but may contain images, audio messages, videos, etc. as well, so we would need additional controls rather than a simple text label. However, all this applies to both sent and received messages, so both data templates would need to contain all these different controls.) This leads us to the conclusion: If two data templates contain the same set of user controls, separating them is not the best approach. Why is this the better solution? Well, besides all the fuss about architecture and separation of concerns, there is one practical reason: Image we’d want to extend our simple messaging app to allow sending images instead of texts. When using different data templates, we’d need to replace the TextBlock control with an Image element in both templates, which is both annoying as it means additional effort and opens up potential copy-and-paste errors!